HOUSTON (KTRK) -- There's an old adage, "age ain't nothing but a number," and all around us we see people who defy time. These men and women perform at levels way beyond their calendar years and remind the world nothing is impossible. Here are a few of our favorite people who will remain "forever young." 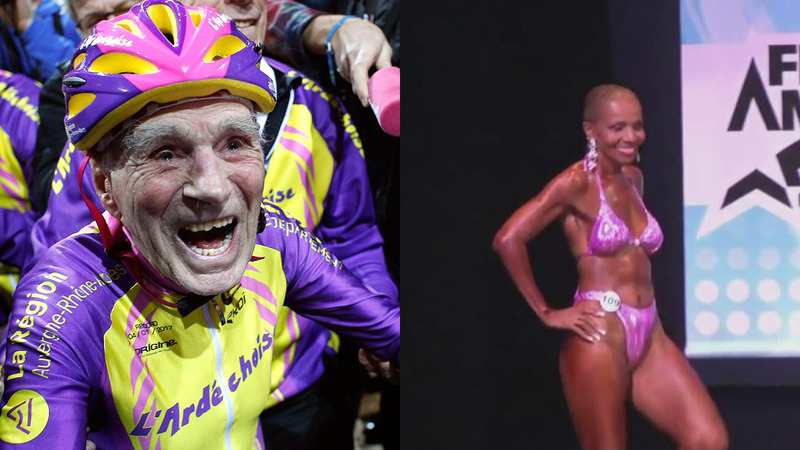 French cyclist Robert Marchand, 105, reacts after setting a record for distance cycled in one hour, at the velodrome of Saint-Quentin en Yvelines, outside Paris. He proved that prediction wrong again in January. Read more of his inspiring story here. Amy Craton,94, of Honolulu, Hawaii is a mother, grandmother, great grandmother - and she's also a newly minted college graduate. If you need some motivation to keep your New Year's resolution going strong, meet Ernestine Shepherd. "My sister and I didn't like the way we looked in bathing suits, so after that, we said, 'We got to get fit!' So we started going to a gym and working out. That started the whole thing," Shepherd said. For more information on Shepherd's latest competition, click here.